Canadian Eastern Championships wrapped up in Duntroon, Ontario, Sunday with the skate portion of the two day pursuit. Tthe men and women skied the same distance on the same course, a two lap 15km free technique pursuit. Start times were based only on Saturday’s 10km classic races, with no bonus points applied. Highlands Nordic showed a lot of different weather over the weekend, slowly warming from -18 on Thursday to Sunday’s freezing drizzle changing to rain. Alexis Dumas (CNEPH) kicked things off, 16 seconds ahead of Andy Shields (Lappe). Jack Carlyle (AWCA) and Philippe Boucher (CNEPH) started 5 and 8 seconds after Shields. On the second lap, Carlyle escaped from the group to win the pursuit with the fastest time of the day, 37:45.80. Boucher was second, 16.89 seconds back, followed by Shields (46.09) and Dumas (1:23.09). In the women’s race, Laura Leclair (CNEPH) completed her medal set, winning the pursuit with the fastest time of the day, 44:03.80. 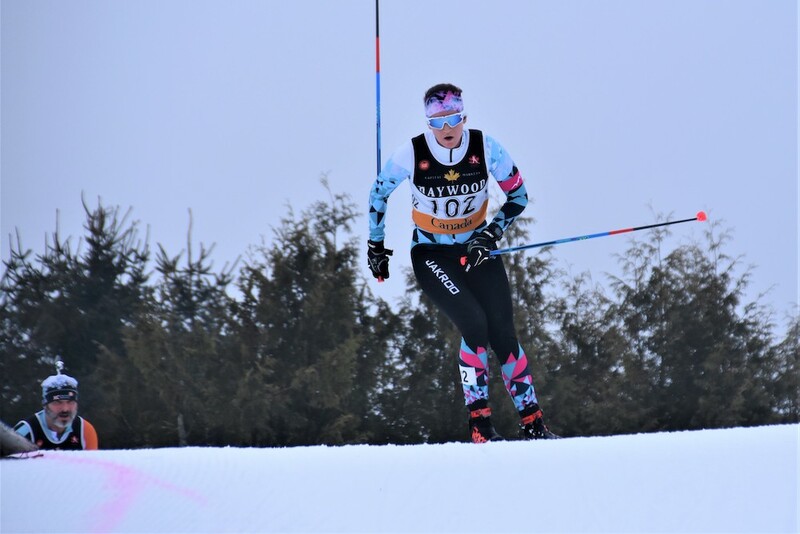 Saturday’s winner Zoë Williams (Nakkertok) held on for second at 59.6 seconds. Annika Richardson (TBay) earned her first senior NorAm podium, 2:21.59 behind.